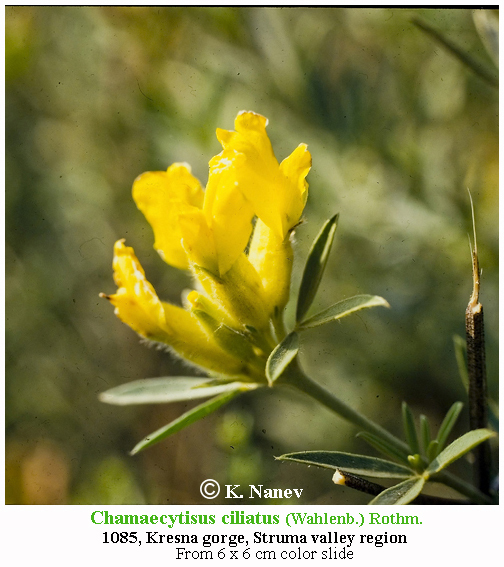 Chamaecytisus ciliatus (Wahlenb.) Rothm. is a synonym of Cytisus hirsutus L.
This name is a synonym of Cytisus hirsutus L.. The record derives from ILDIS (data supplied on 2010-07-14) which reports it as a synonym (record 8716 [mirror]). This name was in version 1 of The Plant List, record ild-8716. 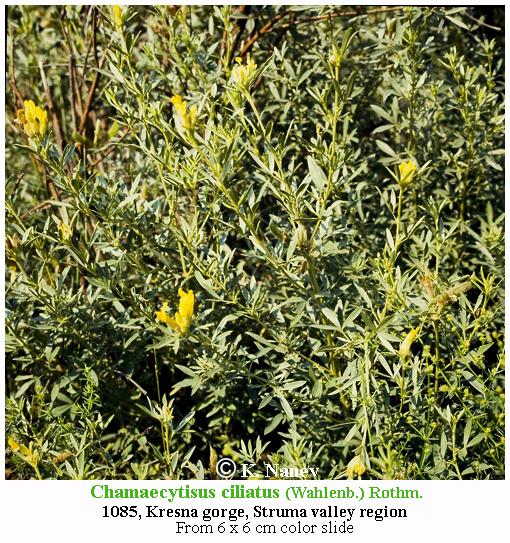 Species: Chamaecytisus ciliatus (Wahlenb.) Rothm. ђ. Bush. Stem 30.0 - 100.0 cm tall, branched from the base, woodened, long outstretched fiber to naked in a circular cross-section; dark gray bark. Branches erect, ascending or rarely recumbent. The shoots 10.0 - 30.0 cm long, 1.0 - 2.0 mm in diameter and branches spread long dense fibrous. Leaves triple; axis 10.0 - 30.0 mm long, spread thickly short to long fiber. Leaflets (10.0) 20.0 - 30.0 mm long and (6.0) 10.0 - 15.0 mm wide, elliptic to ovate back at the base wedge narrow, short, to 1.0 mm long , spread fibrous stems, atop rounded, blunt to wedge cut, entire, above dark green, bare or less absently spread fibrous underneath a light green, more or less densely spread his long stringy, on the edge more or less ciliates. Single flower or 2 - 3 (6) in the bosom of the leaves along the branches forming a loose concise bilateral leaved raceme. Flower stems 8.0 - 10.0 mm in length, spread a thick fibrous. Calyx 10.0 - 12.0 mm long and 5.0 - 6.0 mm wide, thickly spread, straight or curved fiber to 1/3 bilabial, upper lip to 1/2 two-pronged, teeth broadly triangular, quite shallow bottom unclear drills. Corolla 20.0 - 25.0 mm long. Flag 15.0 -16.0 mm wide, broadly elliptical to nearly circular, the top entire or shallow incised in the bottom third more or less gradually narrowed in thin long fingernail longer than the wings and keel, bright yellow, red brown spots at the base or without such, naked or on the back in the middle fiber. Elliptical wings shovel-like, the base more or less asymmetrically narrowed into thin long nails; equal to the keel, bright yellow, naked. The keel elliptical rhombic, sickle curved at the base with thin long nails, bright yellow, naked short edge fiber. Beans 2.0 - 4.0 cm long and 5.0 - 8.0 mm wide, linear Lancet, the top short- protracted, flattened, narrowly elliptical cross section, on the surface goal at the seams densely long straight fibrous, with 4 – 6 seeds. Seeds 2.8 - 3.0 mm in length and 2.2 - 2.5 mm wide, lenticular ovate, yellow-green to green brown, smooth. var. ciliatus. The leaflets atop naked. Northeast Bulgaria (Shumen) Fore, Stara Planina, Sofia Region, Vitosha Region, Znepole region, Mesta River Valley, South Pirin, Eastern Rhodopes. var. grisebachii (Briq.) Kuzm., comb. n .; Cytisus hirsutus subsp. ciliatus var. grisebachii Briq., op. c. 170; Cytisus ponticus auct. Griseb., Spicil. Fl. Rum. Bithyn. I (1843) 9, non Will. 1809. Leaflets on top absently spread fiber. Northeast Bulgaria (Novi Pazar), Stara Planina, Vitosha Region (Vitosha - Kladnitsa Monastery) Rila (above. Separeva bath). Indicate for: Slavyanka (Stoyan. Steph., 1948); Tundzha hilly plain (p. Mitirizovo - Urum., 1905; St. Iliysko heights - Yordanov, 1942, 1947; Maritsa - VeL, 1903). Note. On peculiarities of bean species is close to Ch. leiocarpus, from which it differs primarily by the nature of indumentum, shoots and partly in the calyx indumentum. 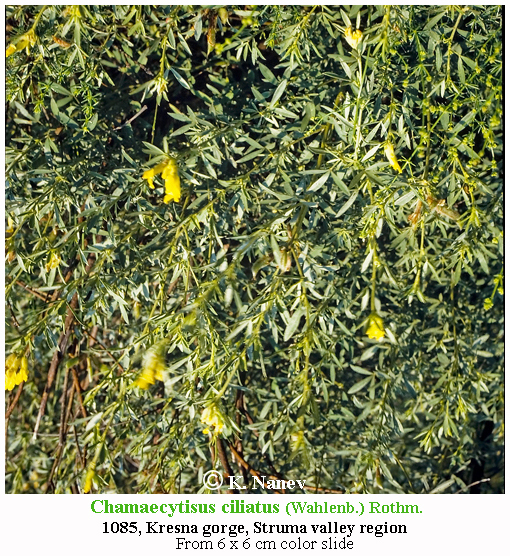 Cytisus hirsutus (clustered broom or hairy broom) is a perennial plant belonging to the genus Cytisus of the Fabaceae family. Cytisus hirsutus reaches on average 30–40 centimetres (12–16 in) of height, with a maximum height of about 100 centimetres (39 in). The stem is more or less ascendent, woody in the lower part, branched, with ascending annual and herbaceous branches (suffruticose) with hairs 3 millimeters long (hence the Latin name hirsutus of this species, meaning hairy). The small deciduous leaves are trifoliate, ovate to elliptic, hairy on both sides, 18–25 millimetres (0.71–0.98 in) long, with a petiole. The flowers are initially orange-yellow, then tend to be colored with reddish brown. The flowering period extends from April through June. Its legumes (seed pods) are 25–40 millimetres (0.98–1.57 in) long, very hairy and mature in late Summer. This plant occurs in Turkey, Austria, Czechoslovakia, Hungary, Switzerland, Albania, Bulgaria, former Yugoslavia, Greece, Italy, Romania and France. These plants can be found on calcareous and arid environments, such as dry meadows and slopes at the edge of the woods. They are typically found at an altitude of 0–1,500 metres (0–4,921 ft). Flowering Time: Blooms: V - VI, fruitful: VII - VIII. Distribution in Bulgaria: Grow in the sparse forests and bushes in the foothills and mountains, often on limestone. Northeastern Bulgaria, Fore, Stara Planina, Vitosha region, Sofia region, Znepole region, River, Mesta Valley. South Pirin, eastern Rhodopes, Rila, from 100 until around 1800 meters altitude. (Conspectus of the Bulgarian Vascular Flora) = conspectus&gs_l= Zlc. Distribution: Central (Austria, Czechoslovakia, Hungary) and Southeast (Romania, Albania, Yugoslavia, Greece) Europe.